Remote Lock: You can remotely lock the managed mobile device. The user will be prompted to enter the passcode of the managed mobile device only if you have set a passcode for the device. This feature is supported for Android, iOS and Windows. In case of Windows, this feature is applicable only for Windows phones. In devices running iOS 7 or later versions, you can also specify a message and a contact number while locking the device. On the web console, navigate to Devices. Under Actions, click on Remote Lock. Enter the contact number and the message that needs to be displayed on the locked screen of the mobile device. You can see the message displayed on the device as shown below. Scan now: You can scan the enrolled mobile device to view details about the installed apps, blacklisted apps and restrictions imposed on the device, along with other device details. You can also view the installed apps and the restrictions imposed on the device. The scanning can be performed only when the device is connected to the internet. This feature is supported for Android, iOS and Windows. If Periodic communication mode is chosen, the scanning operation has a 60-minute communication interval with the server. So, scanning will take place only the next time, when the device interacts with the server. Remote Alarm: You can trigger an alarm on the mobile device if it is lost or stolen. It sounds an alarm even if the device is in silent mode. The alarm will stop ringing only when the device is unlocked. This feature is applicable for Android, iOS and Windows, with iOS requiring Lost Mode to be enabled for Remote Alarm to work. In case of Windows, this feature is supported only for phones. Complete Wipe: All the data in the device will be completely wiped out. The device will become as good as new. You can also wipe all the data from the SD card, for Knox devices. In case of Windows 10 devices (OS version 1809 or later), the enrollment can optionally be retained even after the data is wiped provided it is enrolled via AutoPilot.For other devices, the provisioning package is retained if Windows ICD enrollment is used. The device can be used again by just assigning new users. Corporate or Selective Wipe: All the profiles and apps that were installed using Mobile Device Manager Plus will be wiped out in iOS and Knox devices. In case of Windows devices and Android devices other than Knox, only profiles will be removed and not the apps. The personal data on the device, will not be affected. Also, the device will no longer be managed by Mobile Device Manager Plus. Clearing the passcode: This command clears the passcode completely. However, the user is prompted to enter a new passcode if a passcode policy was previously associated with the device. Clearing the passcode also clears the biometric-based passcodes in all iOS and Android devices (provisioned as Device Owner) except for Samsung devices running Android 5.0. This feature is not supported for Windows. Reset Passcode: You can reset the passcode on the managed Android device, using this command. If the new passcode does not meet the complexity criteria set for the device or if no passcode was set on the device (using device settings), the user will be prompted to set a passcode as per the associated passcode policy. So, it is better to set a password which adheres to the associated passcode policy. This is applicable for Android and Windows devices. For Android devices, you can specify the new passcode to be set on the device and choose to send a notification mail to the user. In case of Windows devices, the new passcode will be generated by the device itself. You can then choose to obtain the new passcode of a particular user's device by mail. When this command is executed on Windows devices with no passcode set up, a new passcode is set up on Win 10 devices. For Win 8.1 devices, a one-time passcode is set up, soon after which a new passcode has to be set up. OS-specific details on Clear and Reset passcode commands are provided in the table below. Passcode-based security commands cannot be executed if the passcode has been set up using other services such as Exchange. In such cases, remove the passcode applied through Exchange and set up a new passcode using MDM. When the passcode is set up through MDM, all the passcode-based commands can be executed. Pause Kiosk: The Pause command lets you pause Kiosk on devices which have been previously provisioned with Kiosk. This command is usually used on devices facing issues and the IT admin needs to troubleshoot the same. You can choose to have the Kiosk automatically resumed after some time by specifying the same. This can be done using the Resume Kiosk command. You can also pause Kiosk using other methods as listed here. This is currently supported only for Android devices. Resume Kiosk: If a device provisioned as Kiosk is paused, the Resume command can be executed to restore the device to Kiosk. Similar to Pause Kiosk, you can choose to resume Kiosk using other methods as listed here. This is currently supported only for Android devices. MDM supports pausing Kiosk and resuming Kiosk using different methods. For example, you can pause Kiosk using remote chat commands and resume it using security commands. Restart: This command lets you restart the device. In case of passcode-protected devices, device must be unlocked at least once for MDM to contact and manage the device. Applicable only for iOS and Windows devices. Shutdown: This command lets you switch off the device. 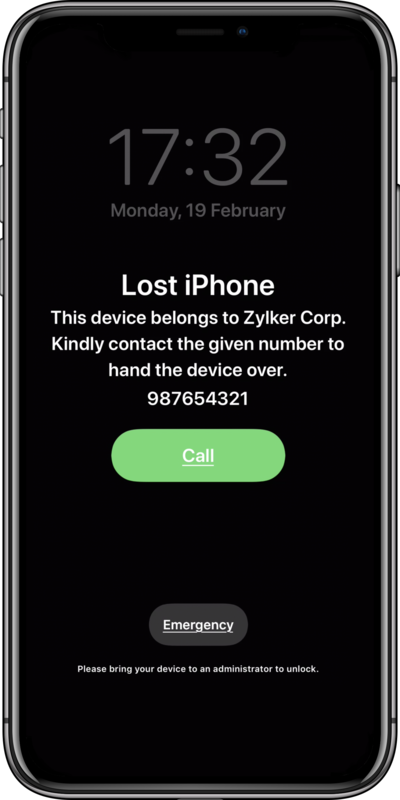 In case of passcode-protected devices, device must be unlocked at least once after switching it on, for MDM to contact and manage the device. Applicable only for iOS devices. Only devices running Android 5.0 or above can be provisioned as Profile Owner or Device Owner. Below Android 5.0 Passcode applied to Samsung and Core Android devices, is cleared. Passcode in Non-Samsung devices, provisioned as Profile Owner or Device Owner, cannot be cleared. Android 5.0 and 6.0 Passcode applied to Samsung and Core Android devices and devices provisioned as Device Owner, is cleared. The work profile passcode in Non-Samsung devices provisioned as Profile Owner cannot be cleared with this command but the device passcode is cleared. Android 7.0 Passcode applied to Samsung devices and devices provisioned as Device Owner is cleared. Passcode applied to Core Android devices and Non-Samsung devices provisioned as Profile Owner cannot be cleared. Below Android 5.0 Passcode applied to Samsung and Core Android devices, is reset. Passcode in Non-Samsung devices, provisioned as Profile Owner or Device Owner, cannot be reset. Android 5.0 and 6.0 Passcode applied to Samsung, Core Android devices and Non-Samsung devices provisioned as Device Owner, is reset. The work profile passcode in Non-Samsung devices provisioned as Profile Owner cannot be reset with this command but the device passcode is reset. Clear Passcode: You can clear the passcode of the Knox Container, using this command. The user will then be prompted to set a new passcode, adhering to the complexity criteria set for the container. Follow the steps mentioned below to use security commands using Mobile Device Manager Plus. On the web console, navigate to Devices under the Inventory tab. Click on the specific device under Device Name. Click on the Action Button which is located on the right side, and select the action that needs to be done. Due to security reasons, you will be prompted to enter your password to authenticate the action to be performed.